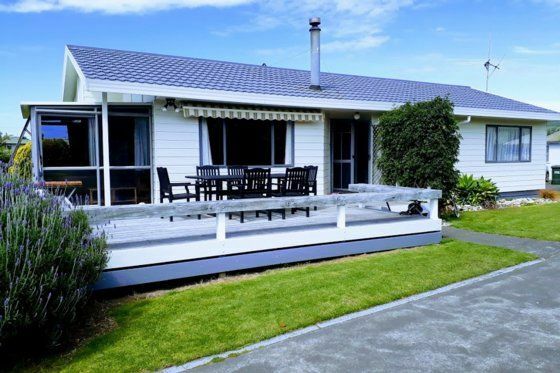 Waimarama is a short scenic 20 min drive from Havelock North and magnificent wineries. It offers you a sandy beach with safe swimming, surfing and good fishing. "Life's a Bach" is a lovely modern open plan home with a logfire for those colder winter nights. Linen is provided so all you need do is bring your food. If you forget any little bits and pieces, don't worry, there's a convenience store just down the road. Welcome to your home away from home. The house is located just 300 metres from the beach. Public holiday weekends will be charged at summer rates. Pet's must stay outside at all times. Please advise if you intend to bring pets along for you holiday. Fully fenced section to keep the dog in, but please keep them outside of the house at all times. Great family Bach not flash but had all basics covered and nice extra provided ie bottle of wine. This was the perfect relaxing Bach and we would definitely look at booking this great place again for a longer summer break. Had a nice relaxing vibe. This was a great house for our beach get away, everything we needed, plenty of space inside and a massive lawn, with a short walk to the beach. The deck with roll out awning was perfect for relaxing out of the scorching sun. Owner was really helpful and great to deal with. Thanks for a lovely holiday. Excellent location with a fantastic driveway for the kids scooters/bikes. We loved our time staying here - perfect for our family escape from the city. We loved our time staying here - perfect for our family escape from the city. We were travelling with a 7 month old, and the house was perfectly set up for children. The complementary bottle of wine made for a lovely arrival, and the bach had everything we need for a lovely, comfortable, relaxing stay. The close proximity to the beach was also great - we can't wait to come back and stay again.